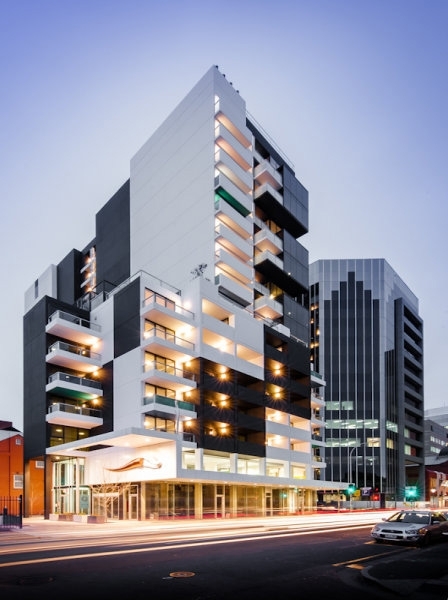 Project partners and tenants gathered to mark the fifth birthday of UNO Apartments, a housing development that offered Australia’s first fully integrated social and private housing, a homelessness service and retail spaces. The innovative project opened in 2012 and there have since been similar developments in other states. UNO was a partnership between the State Government through Housing SA and Renewal SA, homelessness and accommodation service provider Unison and St John's Youth Service. There are 146 apartments over 17 storeys, with a combination of affordable home ownership, affordable private rental, public housing and general market housing. There are retail spaces on the ground floor and commercial tenants on the first two levels. The Youth110 service run by St John’s Youth Services has 30 apartments for crisis accommodation for vulnerable young people, including young parents. The service has helped at least 950 young people since opening. Unison, the property and tenancy manager, provides on-site place management services that help to integrate the building’s diverse residents with each other and their local community.